AshleyNewell.me: A Card and LOTS o LOVE Candy! A Card and LOTS o LOVE Candy! Here's my first Valentine's Day card of the year. It's a great segway into all the wonderful LOVE candy that is available right now! Holy moly! There's a lot of blog candy in the blogosphere! ~First off, Pat over at the Rubber Maid is offering up blog candy for an amazing cause! She's collecting Valentine's Day cards for the Children's Hospital of Michigan. She's trying to collect 1000 so that the kids can exchange cards with friends and family. We NEED to help her out people! She's even sweetening the pot with some blog candy! 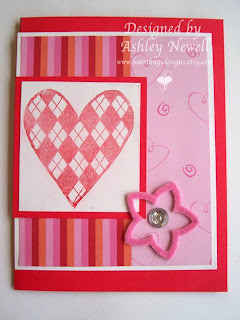 ~Second, speaking of LOVE cards, Joy has some Short Cuts candy over on her blog. (I think Joy and I are the same person, btw. Just thought I'd put that out there.) Anyhow, while you are making V-day cards for Pat, enter one in Joy's candy! ~Last, but CERTAINLY not least, Starving Artistamps has some AMAZING new stamp sets for Valentine's Day. I might have to buy some to help me make lots of cards for the children's hospital! These stamps are cute cute cute and they are offering a chance to win them HERE. This is a cute Card Ashley! Happy Birthday yesterday!!! I am sure you will adore your cuttle bug!!! I love using my Big Shot and my Cuttle Bug Embossing Folders and my Nestibilites as well! Yep you were the blog I was talking about about an hour ago I was here and you were 580 and now you are 529 so they must be having some major wacko problems!!! I know I am not 436 though that would be nice!!! Yeah when I first started it had me at like 260 or somthing and then a couple of days later I was at 936. I figured since I was a new blogger the 936 was more like the real number!!! LOL!! ashley, love it!!!!!!!!!! thanks for the shoutout and sharing the LOOOOOVE! you're amazing!